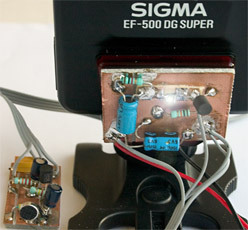 This article will describe my home made sound trigger electronic kit. 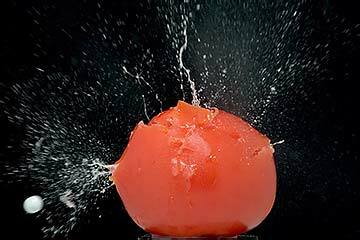 I use this circuit kit to take high speed photos like the nice tomato splash shown here (more about high speed photography setups). This circuit is not complicated and the total cost is low so it is even suitable as your first electronics kit. The general use is quite simple: setup a noisy event to trigger the flash. Since I am using the Sigma EF-500 Flash, which have an internal “dumb slave”, I activate a led to tell the flash when to fire. A more general solution can be found here. he circuit consists of 2 parts. The first part is a very simple microphone pre-amplifier. The second is the light generator, to trig the Flash. Delay control: The distance between the microphone and the sound-source is varied, to get a simple timing delay. If you want to see more sophisticated delay circuits, you can look here. This means that the microphone cant be located on the flash. A simple solution would to just put long wires on the microphone. But that would not be a god solution, because the long wire would be susceptible for electric noise. To avoid this the long wire after microphone pre-amplifier instead. As seen in the picture to the in the top, the circuit is made so that the white LED fits over the sensor in the flash.